Benaroya Hall has opened up Third Tier tickets for tomorrow’s Keith Jarrett/Gary Peacock/Jack DeJohnette performance. Tickets start at $25 ($23 for Earshot members and senior citizens, $12 for students) and can be purchased directed through Benaroya Hall by calling (206) 215-4747 or online. Earshot Jazz Festival 2011 presented Seattle gem, pianist Nelda Swiggett, who creates what All About Jazz called “refined and confident, open and inviting” music with “a bright palette, a sinewy execution, and a powerful, assertive command” with Chris Symer (bass), Byron Vannoy (drums), Rachel Swerdlow (viola), and Walter Gray (cello). NOTE: Das Kapital has cancelled their US tour and will not be opening for this event. 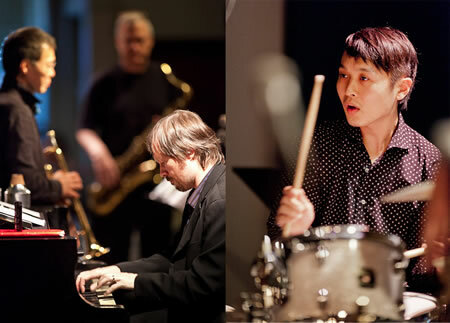 The pianist – a former Seattleite who was Earshot Golden Ear Award winner for best emerging jazz artist in 1992 and 1993 – gained early notoriety with drum legend Tony Williams, vocalist Betty Carter, and his own brilliant trio releases. 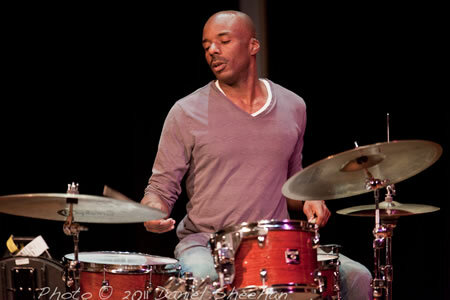 Here, he appears with Matt Jorgensen (drums) and Essiet Essiet (bass). $14 general, $12 members/seniors, $7 students Call 206-443-4221 for reservations. Jay Thomas performed last Saturday and Sunday at Tula’s with the Shunzo Ohno Group as part of the Earshot Jazz Festival 2011. 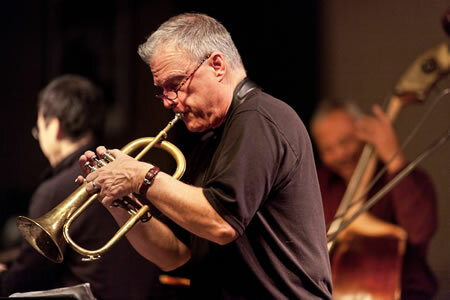 Seattle’s multihorn great collaborated with the searing, stylish, New York-based Japanese trumpet bebopper Shunzo Ohno, a veteran of Art Blakey’s Jazz Messengers, and Phil Sparks, bass John Hanson, piano. 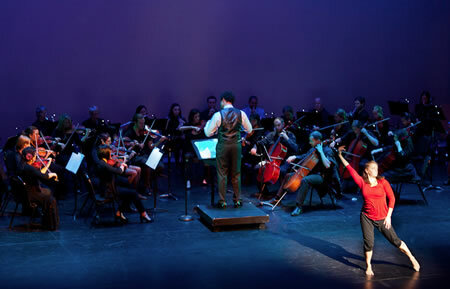 Here are some pictures from their performance. See more photos at Eye Shot Jazz. 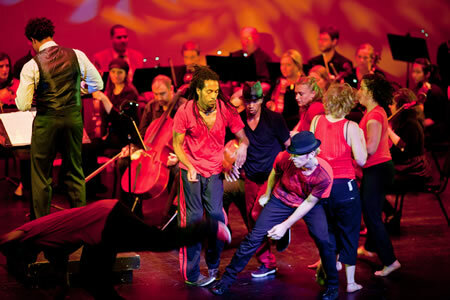 Drummer Allison Miller, violinist Jenny Scheinman, pianist Myra Melford, and bassist Todd Sickafoose are Boom Tic Boom. 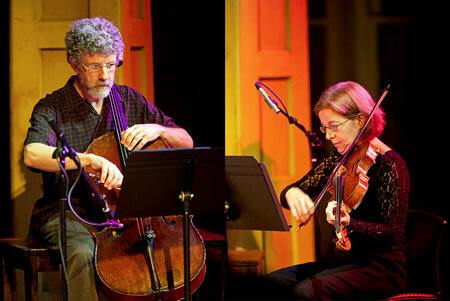 Join us to hear this explosive quartet preview their evening concert and share their insights on music making. Free and open to the public. 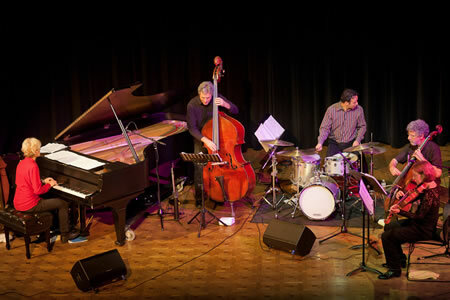 This energetic Seattle quartet performs originals drawn from jazz, rock, soul, and improvised music, inspired by fusion supergroups as well as modern jazz outfits like Chris Potter’s Underground and Kneebody. It features Art Brown (alto sax), Aaron Otheim (keys), Tim Carey (bass), and Tarik Abouzied (drums). $12 general, $10 members/seniors, $6 students Call 206-443-4221 for reservations. This Week the Earshot Jazz Festival visits the PONCHO Concert Hall at Cornish College of the Arts (710 East Roy St, Kerry Hall). This rising piano star appears with Noah Garabedian (bass) and Evan Hughes (drums). Still in his early 20s, and adept in jazz and classical modes, the New Yorker plays with dynamic maturity and technical ferocity. Cornish College trumpeter/composer Jim Knapp and his one-time student, viola player Eyvind Kang, lead a 16-piece string orchestra, joined by the incomparable vocalist Jay Clayton, who returns from New York to Cornish, where she taught for many years, to mark her 70th birthday. A night of Cornish alums. 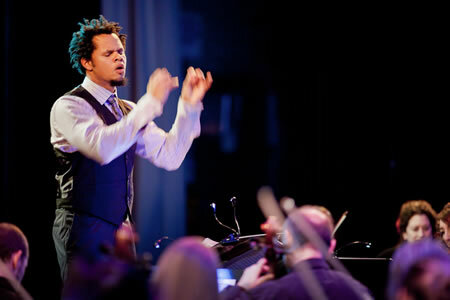 Vaunted vocalist Jay Clayton’s quartet includes pianist Dawn Clement. Drummer Jerry Granelli, whom Jazz Times called “one of those uncategorizable veteran percussionists who’s done it all,” appears with his longtime trio of Danny Oore (sax) and Simon Fisk (bass/cello). The Vancouver BC saxophonist has played with B3 master Dr Lonnie Smith, The Night Crawlers, and mellow vocalist Paul Anka while also excelling as a leader. His The Many Deeds of Cory Weeds (2010) featured organist Joey DeFrancesco, and remained in the JazzWeek charts for 10 weeks. 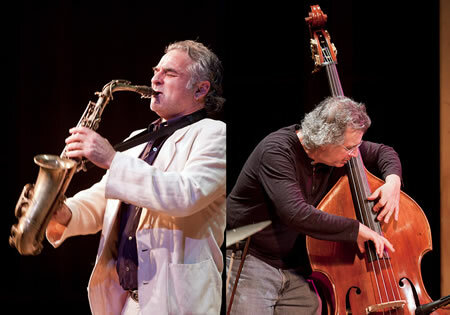 This energetic Seattle quartet performs originals drawn from jazz, rock, soul, and improvised music, inspired by fusion supergroups as well as modern jazz outfits like Chris Potter’s Underground and Kneebody. It features Art Brown (alto sax), Aaron Otheim (keys), Tim Carey (bass), and Tarik Abouzied (drums). 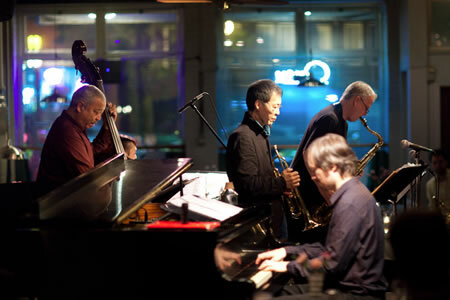 The pianist – a former Seattleite who was Earshot Golden Ear Award winner for best emerging jazz artist in 1992 and 1993 – gained early notoriety with drum legend Tony Williams, vocalist Betty Carter, and his own brilliant trio releases. 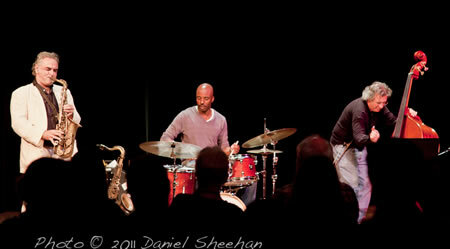 Here, he appears with Matt Jorgensen (drums) and Essiet Essiet (bass). 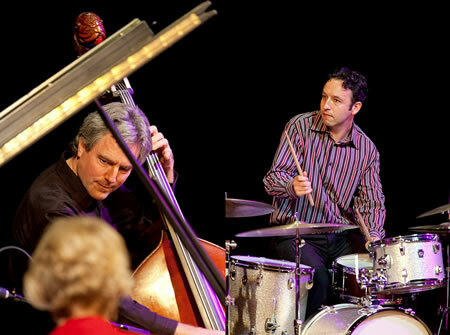 Drummer Jerry Granelli, whom Jazz Times called “one of those uncategorizable veteran percussionists who’s done it all,” appears with his longtime trio of Danny Oore (sax) and Simon Fisk (bass/cello). Tickets are on sale now for all events. 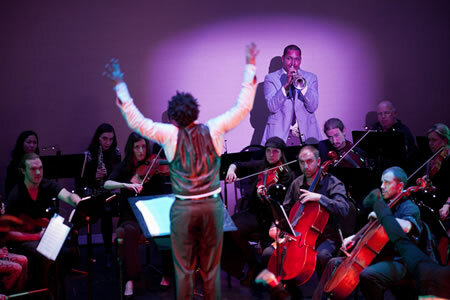 Go to Earshot Jazz for more information. Still to Come: The Bad Plus, Keith Jarrett/Gary Peacock/Jack DeJohnette, Burn List, Bill Charlap and Renee Rosnes, Operation ID, Robin Holcomb, Malcolm Goldstein, SWOJO and Grace Kelly. The Vancouver BC saxophonist has played with B3 master Dr Lonnie Smith, The Night Crawlers, and mellow vocalist Paul Anka while also excelling as a leader. His The Many Deeds of Cory Weeds (2010) featured organist Joey DeFrancesco, and remained in the JazzWeek charts for 10 weeks. $12 general, $10 members/seniors, $6 students Call 206-443-4221 for reservations. The Pacific Jazz Institute at Dimitriou’s Jazz Alley presents jazz vocalist René Marie for two nights. 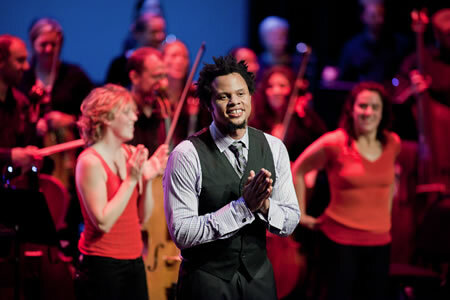 Band members are Kevin Bales (piano), Kevin Hamilton (bass) and Quentin Baxter (drums). Set times Tuesday and Wednesday at 7:30pm. Doors at 6pm on Tuesday and 5:30pm on Wednesday. René Marie, the award winning singer whose style incorporates elements of jazz, soul, blues and gospel, has quickly become a heroine to many; a woman of great strength exuding stamina and compassion; often explaining how finding her voice and self through singing gave her the courage to leave an abusive marriage. But since the release of her recording debut, Renaissance, this Colorado based heroine has also evolved into one of the most sensuous vocalists of our time. Unmistakably honest and unpretentious while transforming audiences with her powerful interpretations, electrifying deliveries and impassioned vocals – René Marie has drawn a legion of fans and music critics who find themselves not only entertained, but encouraged. 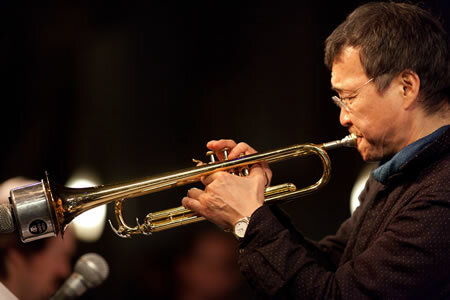 A veteran of both Art Blakey’s and Gil Evans’ bands, trumpeter Shunzo Ohno shares his talent and perspective at this noontime masterclass/clinic. Free and open to the public. A special Monday night jazz lesson from soulful, searing alto saxophonist Wessell “Warm Daddy” Anderson, with a group of top Seattle sidemen. $14 general, $12 members/seniors, $7 students Call 206-443-4221 for reservations. Seattle’s multihorn great collaborates with searing, stylish, New York-based Japanese trumpet bebopper Shunzo Ohno, a veteran of Art Blakey’s Jazz Messengers, with a fine Seattle lineup. $15 general, $13 members/seniors, $7 students Call 206-443-4221 for reservations. Today is Saturday, or as we call it, Jimmy Cobb Day! 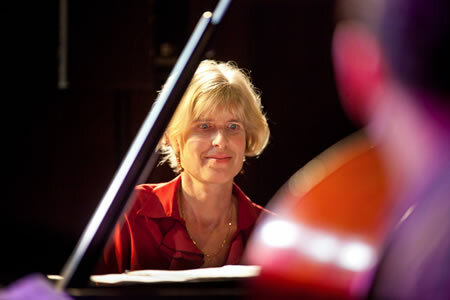 The vocalist and Cornish instructor was acclaimed early by DownBeat, studied at the prestigious Thelonious Monk Institute, and works often with trumpeter Nicholas Payton who has lavished her with praise. 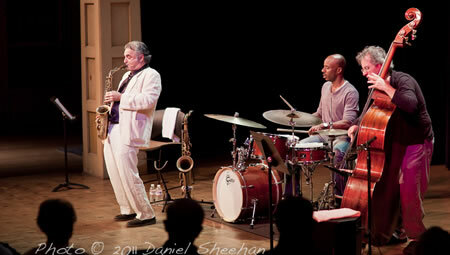 With Dawn Clement (piano), Chris Symer (bass), and Byron Vannoy (drums). $14 general, $12 members/seniors, $7 students Call 206-443-4221 for reservations. This Friday, October 21, 2011, Brad Mehldau returns to Seattle to play a solo set as part of the 2011 Earshot Jazz Festival. The 41-year-old performer, arranger, and composer has performed in Seattle many times before — most recently this past April with his trio — but this concert presents a rare opportunity to hear one of the world’s preeminent jazz pianists perform alone in a recital setting. The evening of live piano will be held at the Nordstrom Recital Hall at Benaroya Hall, which is a perfect setting for the event. In this intimate performance hall, Mehldau is sure to astound the audience with his subtly, technical abilities, and artistry. Mehldau often uses solo performances as a testing ground for new compositions, so even the most ardent fan is sure to hear something new.?? Some of Mehldau’s most inspiring performances come from his collaborations with other musicians; however, something special happens in a live solo setting when a musician’s sole focus is on the sounds coming from his own instrument. With Mehldau, improvisations based on old standards, and even recent rock tunes, seem to flow freely from the piano without a single note sounding forced or out of place, as if they are part of the original tune. At the same time, the inherent simplicity of some of the tunes Mehldau chooses to play offers him an extreme amount of freedom to experiment, taking the songs to seemingly unimaginable places. You can hear a bit of this on Mehldau’s first solo album “Elegiac Cycle,” but his live solo album, “Live in Tokyo,” and his latest work, “Live in Marciac,” offer the best chance to get a glimpse of what audiences may be in for this Friday night. This weekend’s performance will be his penultimate gig before leaving on a two-month tour of Europe. Tickets for this night of solo piano with Brad Mehldau are $32 ($30 for Earshot members and seniors, $16 for students) and are available at the Benaroya Hall box office. The “likably suave jazz singer” (NY Times), a Swiss New Yorker, has forged jazz, R&B, gospel, musical theater, and Latin jazz into a personal style based in European song. $14 general, $12 members/seniors, $7 students Call 206-443-4221 for reservations. 2214 2nd Ave, 8pm Call 206-443-4221 for reservations. JAZZ ALLEY: Louis Prima Jr.